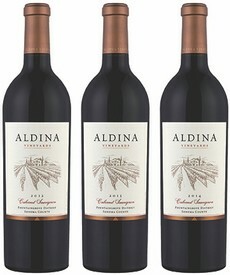 Aldina Vineyards cultivates & crafts pure, elegant Cabernet Sauvignon. Our style respects the Cabernet varietal and captures the essence of the wine from the estate vineyard where it is grown, allowing us to elevate the exceptional wines we are making. Aldina Vineyards sits atop the ridgeline of the Mayacamas Mountains in Sonoma's newest American Viticultural Area, the Fountaingrove District. What makes Aldina Vineyards special is the passion and expression of our wines, the team that drives it and the philosophy that guides us. Get a taste of each unique vintage of Aldina Vineyards Cabernet Sauvignon in this special bundle, featuring our inaugural 2012 through our youngest vintage, 2014. The 2012 Aldina Cabernet Sauvignon offers soft, luscious tannins with nuances of dark chocolate, dried herbs and spice with a velvety, juicy finish and toasty hints from the new French Oak. The 2013 Aldina Cabernet Sauvignon is an approachable, yet elegant wine. The flavors are layers of cola, rhubarb, and toasted vanilla that give a nice density to the palate. Our 2014 vintage showcases the small, concentrated berries from the red volcanic soils of our estate mountaintop vineyard and has a youthful energy with spicy layers of chocolate, plum and red fruit.